Bluegrass, Americana & Folk – Old and new tunes about broken hearts and lonesome nights; trains, mothers, coal mining, murder, whiskey and going home… All the misery and tears you could wish for wrapped in the joy of singing and playing acoustic only. Hot bluegrass, smooth harmonies, fast instrumentals. 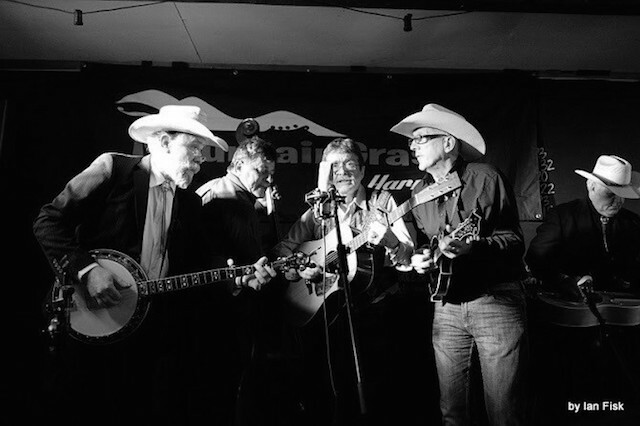 Now recognised as one of Australia’s leading bluegrass bands, they have been playing together and with others in Australia and overseas since the 1960’s. 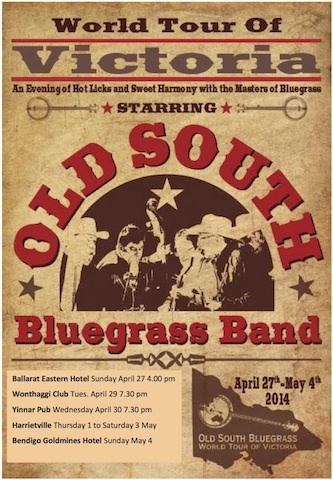 Since 2011, Old South has been frequently invited both to play and present workshops at the Fleurieu Folk Festival, The Wirrina Bluegrass Festival, The Great Alpine Pick, the Harrietville Bluegrass Convention, the MountainGrass Festival, the Kelly Country Pick, The Kapunda Celtic Festival and the Semaphore Music Festival. Old South will release their second CD later this year. Phil Parker – Lead singer, guitar. Phil has a clear and powerful vocal style, perfect for the music. Having played in four bluegrass bands, he has developed a commanding knowledge of harmony theory and technique, and ensures everyone knows their parts and remembers them. Geoff Bridgland – Baritone, banjo, fiddle. Geoff has been playing bluegrass with a range of bands since he was in the “Black Mountain Bluegrass Boys” in 1968. Geoff plays 5 string banjo as straight as he can and is sometimes allowed to irritate the old-time fiddle for a short while. international competition in Nashville, Tennessee in 1989. Dave Taylor – Tenor, double bass. The thinking man’s bassist, tenor harmony singer and Timelord. His high harmony rounds out the Old South sound and his jokes have made the men realise that reality is optional after all, which puts him way ahead in this game. Leonard Cohen – High baritone, Resonator guitar. One of the founders of the Hamilton County Bluegrass Band in NZ, he joined the Skillet Lickers on moving to Adelaide. He has toured widely, played with Pete and Mike Seeger, Slim Dusty and Reg Lindsay, recorded six albums and performed on TV and radio. Leonard has played before the Prince of Wales and another pub in Dubbo.